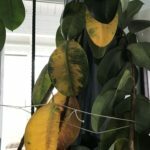 Why is my rubber tree plant losing its leaves. Also, there are little brown things that look like bumps on the stems. Please help, it's almost 5 years old.